Miniature game consoles are all the rage right now. Many of the big names in gaming are releasing their own official “mini” versions of their classic machines, but naturally we see plenty of DIY builds around these parts as well. Generally they’re enclosed in a 3D printed model of whatever system they’re looking to emulate, but as you might expect that involves a lot of sanding and painting to achieve a professional look. But for SEGA Genesis (or Mega Drive as it was known outside the US) fans, there’s a new option. A company by the name of Retro Electro Models has released a high-fidelity scale model of SEGA’s classic console, so naturally somebody hacked it to hold a Raspberry Pi. Wanting to do the scale detailing of the model justice, [Andrew Armstrong] went the extra mile to get the power button on the front of the console working, and even added support for swapping games via RFID tags. [Andrew] uses the Raspberry Pi 3 A+ which ended up being the perfect size to fit inside the model. Fitting the Pi Zero would have been even easier, but it lacks the horsepower of its bigger siblings. 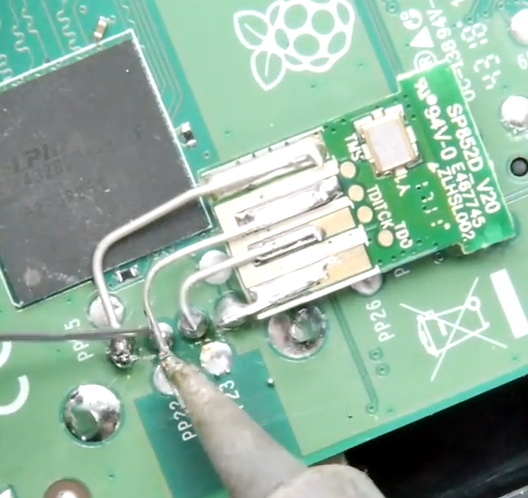 The RFID reader is connected to the Pi over SPI, and the reed switch used to detect when the power switch has been moved is wired directly to the GPIO pins. 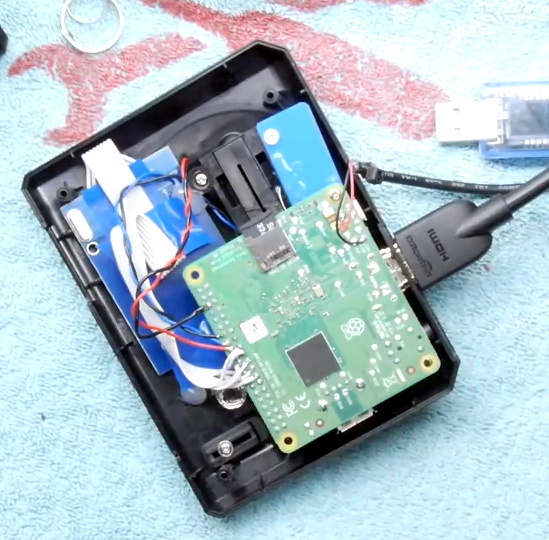 The system is powered by a USB cable soldered directly to Pi’s PCB and ran out a small hole in the back of the case. For input, [Andrew] is using a small wireless keyboard that includes a touch pad and gaming controls. Unfortunately, it has a proprietary receiver which had to be integrated into the system. In a particularly nice touch, he used snipped off component leads to “wire” the receiver’s PCB directly to the pins of the Pi’s USB port. Not only does it look cool, but provides a rigid enough connection that he didn’t even need to glue it down to keep it from rattling around inside the case. Definitely a tip to keep in the back of your mind. The software side of this project is about what you’d expect for an emulation console, though with the added trickery of loading games based on their RFID tag. At this point [Andrew] only has a single “cartridge” for the system, so he simply drops the tags into the cartridge slot of the console to load up a new title. It doesn’t look like Retro Electro Models is selling loose cartridges (which makes sense, all things considered), so there might still be a job for your 3D printer yet if you want to have a library of scale cartridges to go with your console. For those of you who were on Team Nintendo in the 1990’s, we’ve seen a similar build done with a 3D printed case. Of course, if even these consoles are a bit too recent for your tastes, you could build a miniature Vectrex instead. The Sega Genesis, or Mega Drive as it was known outside North America, was a popular console for the simple fact that Sega did what Nintendidn’t. Anachronistic marketing jokes aside, it brought fast scrolling 16-bit games to a home console platform and won many fans over the years. You may find yourself wanting to interface with the old controller hardware, and in that case, [Jon Thysell] is here to help. [Jon] has done the work required to understand the Sega controller interface, and has shared his work on Github. The interface is an interesting one, and varies depending on the exact console and controller hardware used. The original Master System, with its D-pad and two buttons, simply uses six pins for the six switches on the controller. The 3-button Genesis pad gets a little more advanced, before things get further complicated with the state-machine-esque 6-button pad setup. [Jon] helpfully breaks down the various interfaces, and makes it possible to interface them with Arduinos relatively easily. Sharing such work allows others to stand on the shoulders of giants and build their own projects. This nets us work such as [Danilo]’s wireless Genesis controller build. By combining the knowledge of the Sega protocol with a few off-the-shelf Arduinos and Bluetooth parts, it makes whipping up a wireless controller easy. In this day and age, most console controllers can be readily interfaced with a PC with a variety of simple solutions – usually USB. You might feel like trying something harder though, for instance interfacing modern Nintendo controllers to a C64. Video after the break. The synth initially allowed only for playback of existing video game scores, but its capability has been expanded as [Thea] took the project from breadboard to protoboard to custom PCBs – with anime artwork, to boot. The synth uses a Teensy 3.5 as the brains, speaking USB to enable the synth to receive MIDI commands from music software. All parameters are exposed over the interface, and [Thea] has several videos showing the Genesynth under control from an Ableton Push. The sound capabilities of the YM2612 are of an entirely different character to most chiptunes, by virtue of the FM synthesis engine. FM synthesis is a little less intuitive then classical additive synthesis, but we still see it crop up now and then. Way back in the dark ages, before the average computer could play back high quality recorded audio, things were done differently. Music and sounds were stored as instructions to be played back on audio synthesis chips, built into the computers and consoles of the 80s and 90s. These chips and their unique voices hold a special nostalgia that’s key to this era, making them popular to experiment with today. To that end, [little-scale] decided to wire up eight chips from the SEGA Master System to please your ears. The chips, laid out on a breadboard with a Teensy LC running the show. The chip in question is the SN76489, which we’ve also noted is used in the Sega Genesis as well. It packs 3 square wave tone generators, and a noise channel as well. With eight of these to play with, that’s 32 total channels. To drive these, [little-scale] decided to go the MIDI route. To get around the MIDI limit of 16 channels, he decided to split the frequency range in half. Each MIDI channel addresses two SN76489 channels, the top pitches being used for one, the lower pitches being used for the other. All this MIDI data is passed to a Teensy LC, which handles transposition of the note data to get everything back in tune, and addresses the eight chips to create a beautiful square wave symphony. Since the Raspberry Pi range of boards first appeared back in 2012, we’ve seen them cleverly integrated into a host of inventive form factors. Today we bring you the latest offering in this space, [Kite]’s Raspberry Pi Zero W installed in the case of a Sega Dreamcast VMU. The result is a particularly nicely executed build in which the Pi with a few of its more bulky components removed or replaced with low-profile alternatives sits on the opposite side of a custom PCB from a small LCD display. The PCB contains the relevant buttons, audio, and power supply circuitry, and when installed in a VMU shell makes for a truly professional quality tiny handheld console. In a particularly nice touch the Pi’s USB connectivity is brought out alongside the SD card on the end of the Zero, under the cap that would have originally protected the VMU’s connector. Some minimal paring away of Sega plastic was required but the case is surprisingly unmodified, and there is plenty of space for a decent-sized battery. The VMU, or Visual Memory Unit, makes an interesting choice for an enclosure, because it is a relic of one of console gaming’s dead ends. It was the memory card for Sega’s last foray into the console market, the Dreamcast, and unlike those of its competitors it formed a tiny handheld console in its own right. Small games for the VMU platform were bundled with full titles, and there was a simple multiplayer system in which VMUs could be linked together. Sadly the Dreamcast lost the console war of the late 1990s and early 2000s to Sony’s PlayStation 2, but it remains a console of note. VMUs are not the most common of gaming survivors, but we’ve shown you one or two projects using them. There was an iPod conversion back in 2010, and much more recently some mind-blowing reverse engineering and emulation on the original VMU hardware. Thanks [Giles Burgess] for the tip.